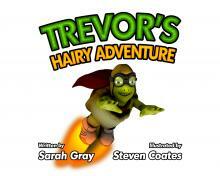 Author Sarah Gray and illustrator Steven Coates bring a children's story with a difference - prepare to blast off with Trevor the Tortoise! Trevor is the most amazing tortoise you could ever hope to meet. His shell was old and creaky and he had worn out all his feet. But in the darkest part of the night, Trevor does something quite fantastic. He fires up his rocket boots and blasts off on a secret, dangerous mission into the jungle! Will he be able to complete his task while avoiding the sharp claws of a ferocious lion? Join him on his hairy adventure to find out!